DO YOUR BIT. ADOPT A HOMELESS ANIMAL. Indian Breed dogs are as lovable and loyal as any other foreign breed dog and deserve as much love, care and above all, respect. They are by all means beautiful, extremely sturdy, intelligent, friendly and good with children as well. Yet they live miserable lives as a result of being neglected on the streets. Hunger, disease, road accidents, scorching summers and freezing winters take the lives of thousands of Indian Breed dogs. Not only do they deserve a better life, but also a chance to prove that they can make excellent pets. So open your heart and home to an Indian dog. Help make the life of a homeless one healthy and happy. CHECK OUT THIS SPACE FOR REGULAR UPDATES ON INDIAN BREED DOGS AND PUPS AVAILABLE FOR ADOPTION ACROSS INDIA. FEATURED ALONGSIDE, WILL BE NOTICES OF ABANDONED PETS AS WELL AS CATS/KITTENS IN NEED OF HOMES. Please note, that all adoptions via the Angel Eyes Pet Adoption Forum are meant to be strictly Free of Cost. Breeders/sellers are requested to avoid participation. 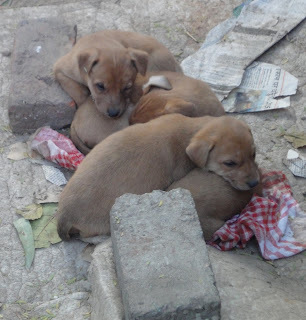 These Indian Pups are Currently battling the Winter on the Streets. Being looked after by an Animal Lover in Basant Lok, they are in need of Warm Homes. To adopt them, contact RPR at 9958866067. We are a group of young, practical-thinking, devoted animal lovers – who simply feel that this earth would not be as splendid and vivid as it is, without the animals and birds around us. And having said so, we feel privileged to stand by their welfare and fight for their cause.